IP cameras, like PCs, take some time to boot up. And just like PCs, the amount of time can vary greatly. Many people do not care but some people find it annoying. Perhaps more importantly, in surveillance, the longer it takes to boot, the longer the camera is down and not recording what's happening. We were somewhat surprised at how significant the variation was and how quick some were and how long at least one of the biggest brands was. 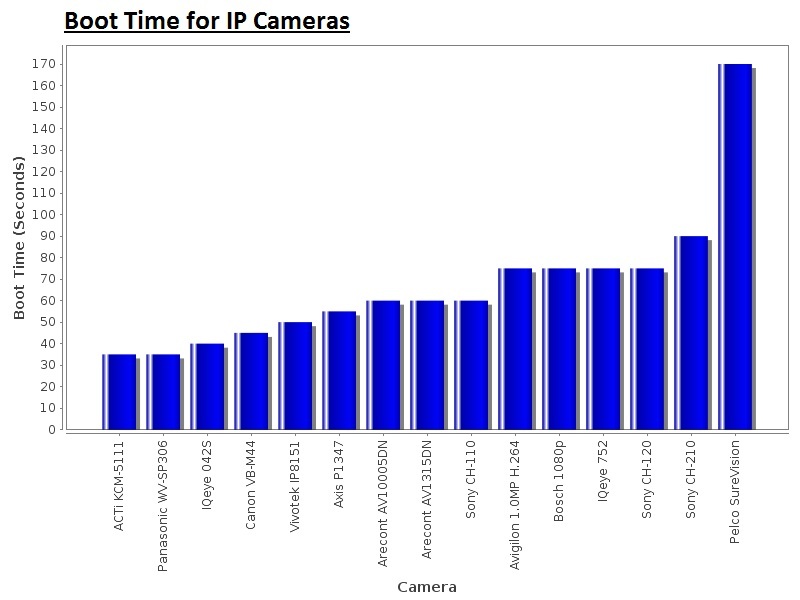 The average time to boot up an IP camera in our roundup was between 1 minute and 1 minute and 15 seconds. The most significant outlier was Pelco Sarix SureVision box camera, coming in at nearly 3 minutes and almost twice as slow to boot as the next slowest. No camera booted up faster than about 30 seconds. 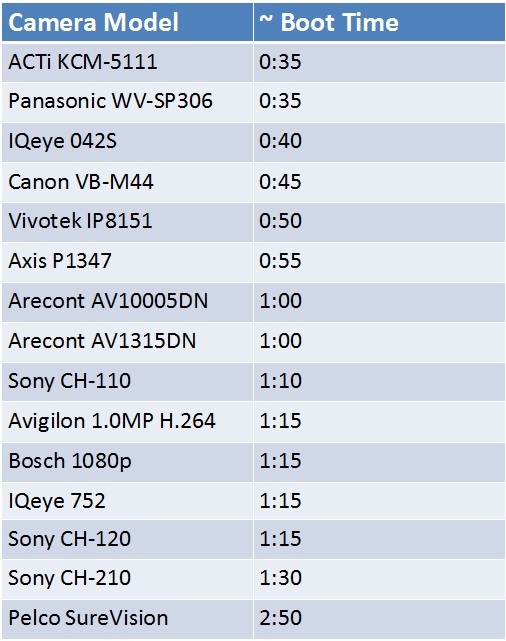 Since IP cameras are computers and almost always run Linux distributions, the boot times were not terribly surprising (obviously save Pelco's). For reference, here is a bootchart comparison of 20 different linux distributions with total boot times ranging from 20 to 40 seconds. We are not certain what causes the range of boot time performance. This is inherently hard to analyze as it involves lower level technical decisions that manufacturers generally will not disclose. However, from a discussion with a few engineering contact, it often involves decisions on the type of hardware selected and the modules selected by the IP camera manufacturer to include in the operating system. We do not believe boot times should be a primary buying decision. However, longer boot times are a usability issue for installers and a potential security risk. For the installer, the longer the boot time, the more they have to wait when installing and troubleshooting. Often, multiple reboots are needed to test things or to make changes to the camera and/or network. For the security user, the longer the boot time, the greater the risk that the camera will miss something will rebooting. While planned reboots are obviously uncommon, random reboots can happen because of network or power issues.